I have been a WSUS user for years. Although there are better patch management tools out there that are also way more expensive, WSUS still manages to stick around and get the job done... For Microsoft related updates at least. Anyway, for the last two months we've been getting hit with bandwidth overage charges at my day job. We have a 6Mbps circuit that is burstable to 10Mbps. Anything over 6Mbps results in overage charges which are not well received by upper management. It's pretty obvious don't you think? 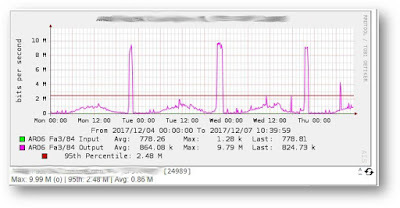 On top of that I ran a data collection from our firewall starting around the time of the spikes and the number one visited URL was wsus.ds.download.windowsupdate.com. Clearly, it's WSUS that is causing us overages! Well there is good news. 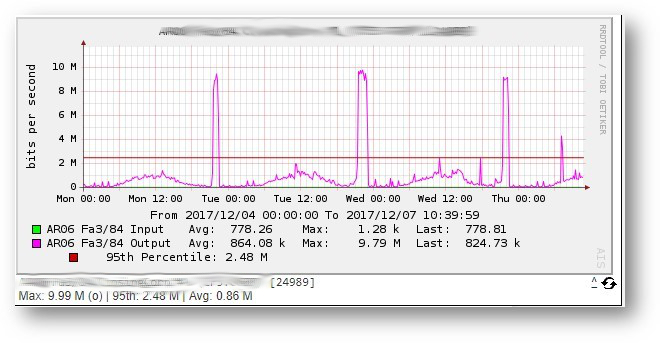 You can easily throttle the bandwidth WSUS uses using a local computer policy! 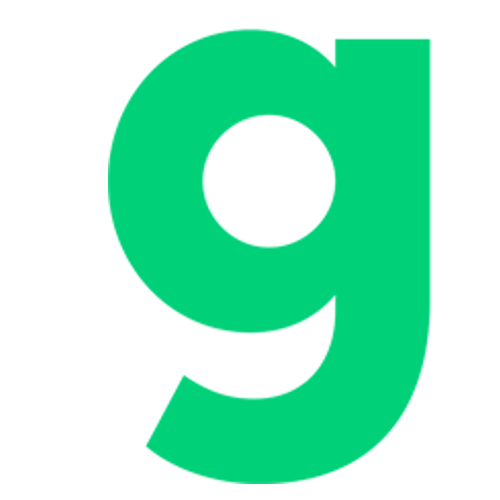 Log on to the server by using an account that is a member of the local Administrators group. In the left pane of the Group Policy Management Console (GPMC), expand Computer Configuration, expand Administrative Templates, expand Network, and then click Background Intelligent Transfer Service. 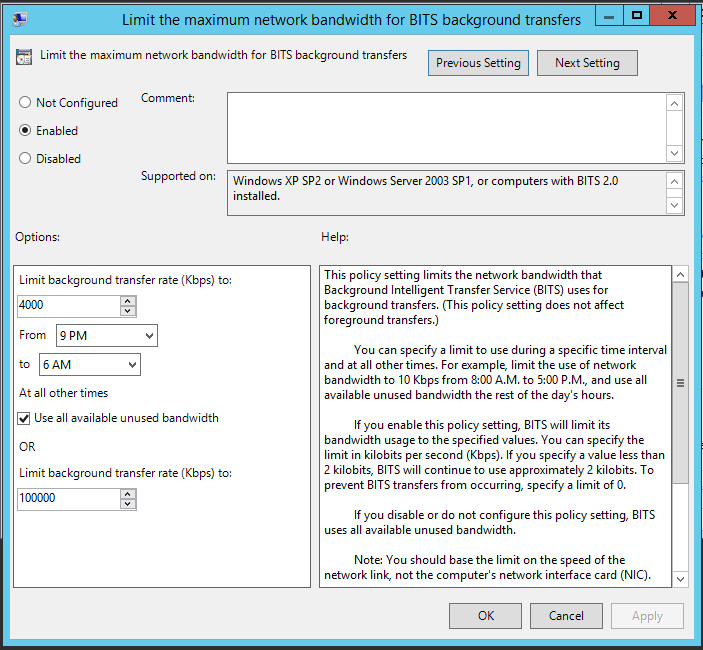 In the Setting pane, double-click Limit the maximum network bandwidth for BITS background transfers. In the top pane of the dialog box, click Enabled. In the Options pane, set the transfer rate in kilobits per second (Kbps) that you want BITS to use. The default value is 10 Kbps. 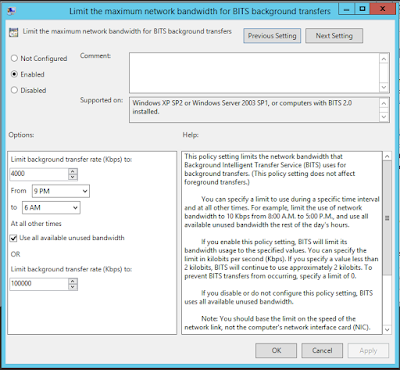 Set the times during which you want to limit bandwidth. The default setting is from 12:00 A.M. to 12:00 A.M.
Set the limitations to use outside the designated time. The default setting is Use all available unused bandwidth. I wanted to keep my WSUS server under the 6Mbps mark, so I set mine to limit bandwidth to 4Mbps (4000 Kbps) between the hours of 9pm to 6am. After setting this, no more spikes and no more overage charges! Boom!